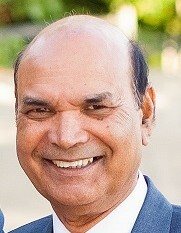 Serafien Khokhar, age 70, of Framingham, passed away on Sunday, February 10, 2019. He is survived by his loving wife of 49 years, Catherine, his four children, Augustine, Huma, Rena and Jimmy, his daughters-in-law, Shabnum and Saken and his grandchildren, Eileen, Alex, Cyrus, Sarah, Angel and Abigail. He is also survived by four brothers, three sisters, and his dear father Rahmat Robert who will be celebrating his 100th birthday in August. Serafien was born in Pakistan and relocated to the USA in 2009. He spent his career as an electrical engineer in Doha, Qatar. Even in his retirement, he kept himself very busy and loved being a handyman to anyone in need. He loved to laugh and dance and kept everyone in his presence entertained with his hilarious sense of humor. He loved his family passionately and was devoted to every member. He touched countless lives with his love, kindness, goodwill and warm spirit. Serafien faithfully served as a Eucharistic Minister at St. Bridget’s Church and was a devoted Catholic. His passing has left a void in the countless lives he touched, and he will forever be remembered with love and adoration. No amount of time with him could have ever been enough and his family will cherish every moment spent with him. Family and friends will honor and remember Serafien’s life by gathering for visiting hours in the McCarthy, McKinney & Lawler Funeral Home, 11 Lincoln St. Framingham, on Friday, February 15th from 4 – 7 P.M. His Funeral Mass will be celebrated on Saturday, February 16th, in St. Bridget’s Church, 830 Worcester Rd. (Rt. 9 E) at 12 noon. Interment will be private.